So I’m a little obsessed with Biscuiteers biscuits. If you’ve not heard of them, Biscuiteers is a company based in the UK that makes gorgeous biscuits for all occasions. I’ve bought them for people in the past but unfortunately never been given them myself. So instead of waiting to be given them I thought why not make them myself? I’ve had the Biscuiteers Book of Iced Biscuits for a while, I’ve just been waiting for the perfect excuse to make the biscuits and last weekend’s Diamond Jubilee seemed to be the perfect reason! 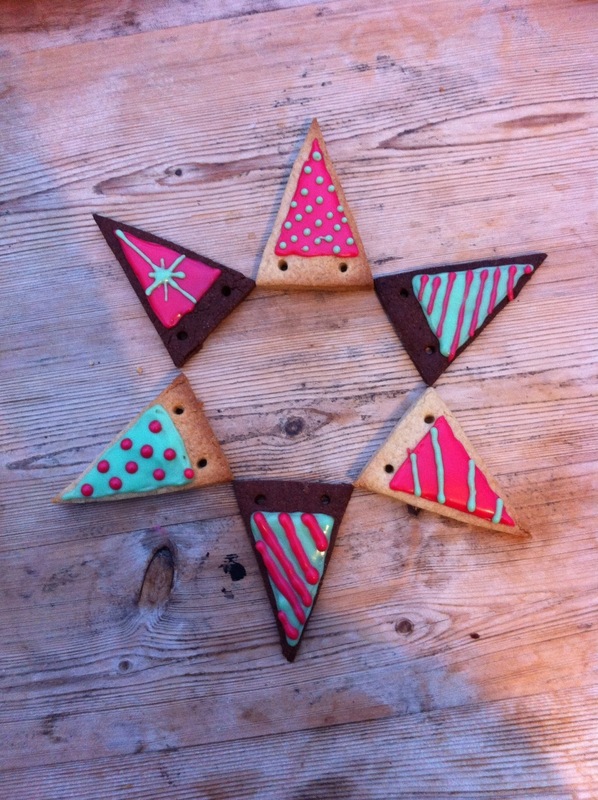 So on Saturday Lau and I set about making jubilee Biscuiteers biscuits and boy was it fun! Before we could start though we had the age old problem of deciding on a flavour, we struggled choosing just one flavour and so settled on a batch of plain biscuits and a batch of super chocolatey ones, well why not! Below is the recipe for the chocolate biscuits, for the plain ones simply leave out the cocoa. 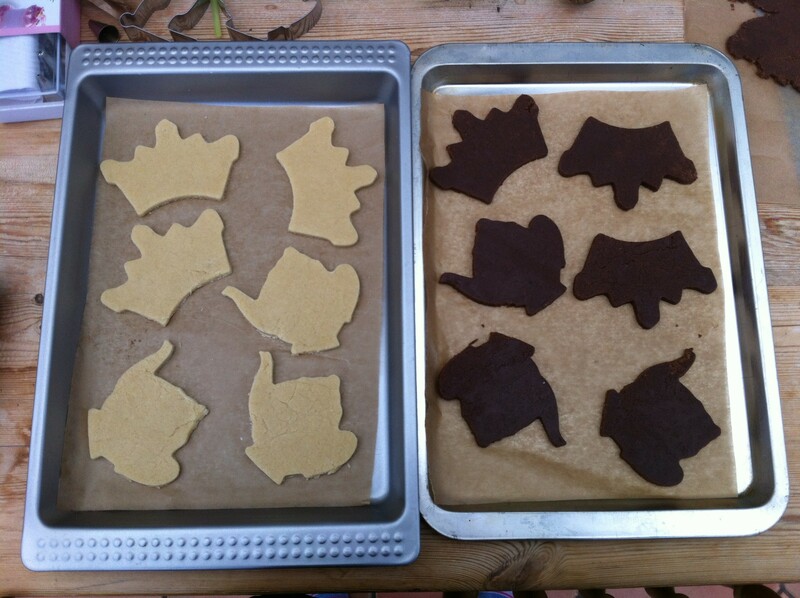 Jubilee crowns and teapots waiting to go in the oven! Place on a baking tray and bake on 170° for 14 – 18 minutes. (Take them out when they start to darken). 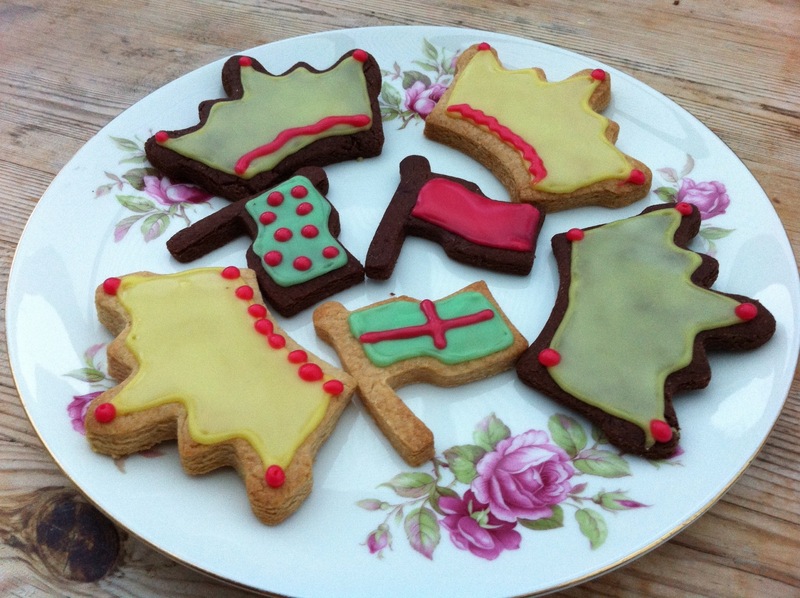 …So having made 70 biscuits, yes 70, we had the small task of decorating them, which was great fun! The icing is super easy to make – simply mix icing sugar with a few drops of water. Once you’ve created a smooth mixture that’s not too runny simply pop the icing into a piping bag. Make the icing different colours by just adding a couple of drops of food colouring once you’ve created the icing, we went with yellow, pink and green. Below are three simple steps to perfect icing, but be warned you might accidentally get some on your hands and have no choice but to taste it before you finish icing! When icing the biscuits start by doing the outline in one colour and then make sure you leave it to dry for five minutes as otherwise when you flood the biscuits the icing will go over the edges. Once the outline of icing is dry you can flood the middle with more icing. Finally once your bottom layer is dry you can add more decoration using contrasting colours, such as our dots and stripes on the bunting. Crowns and flags – happy Jubilee! 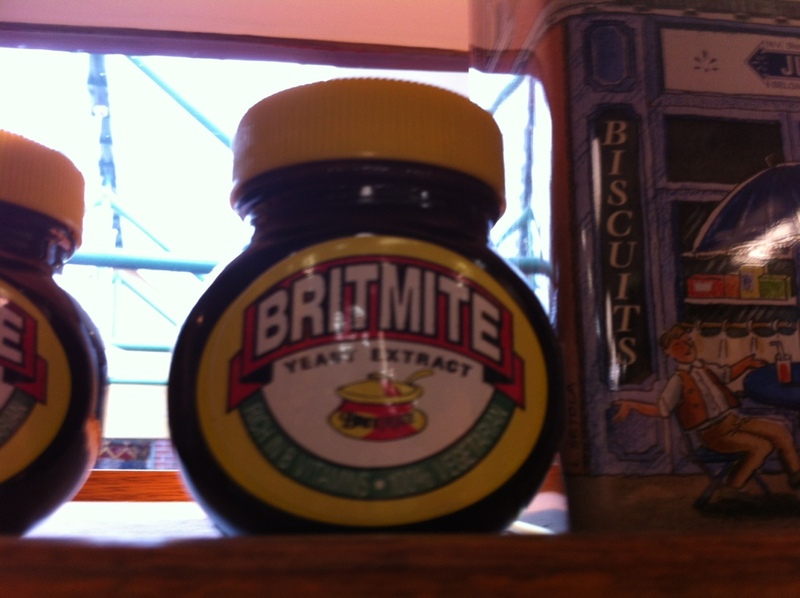 Now neiter Lau or I like Marmite but we did see this whilst in Australia and thought it was genius! It was in a little sweet shop in Leura, which is up in The Blue Mountains just outside Sydney. The shop was full of all sorts of things, including the biggest selection of Pez we’ve ever seen. Back to marmite though, changing the name like this is so clever and a great marketing ploy. There’s also another version, Ma’amite, that we saw recently that’s been done specifically for the Queen’s Jubilee, again genius!